We wanted to share some tips and advice on what to choose as well as what are some of the more common issues with these PCI-E to USB 3.0 extenders based on our experience so far. These risers boards essentially move the video cards away from the motherboard and have enough space in between them to ensure good cooling. 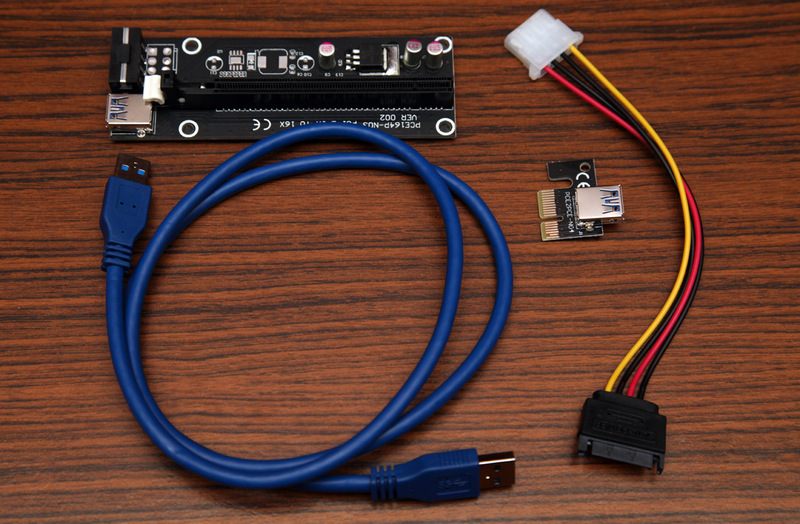 They consist of a couple of components – main board with the video card slot, smaller PCI-E board for connecting to the motherboard, USB 3.0 cable and an optional power adapter (Molex to SATA Power, SATA Power to Molex, PCI-E Power to SATA Power or some other variation). Starting up with the color of the PCB of the raiser board, it seems that black and blue boards are generally of higher build quality than the green ones, so go for either of the two colors if you have the option to avoid green boards. Starting up with the main board where most things can go wrong, even though rarely there is an issue with these, you can still get into plenty of trouble. The number one problem we’ve experienced with problematic and non-working extenders is due to poor soldering of elements. So checking out the solder joints is always a good idea even before installing the extenders and not after that when there might be something wrong. Check the solder connections of the connectors and the few elements on the board – if everything is in place and makes a good contact with the PCB. Especially check the soldering of the voltage regulator as if not properly soldered everything might seem to be working fine, but you may still not get image outputted to the display and the GPU not working properly. We’ve also seen bad batches of extenders with the wrong LDO voltage regulators soldered on the PCB, so you might want to check the markings on these as well and verify that they are with 3.3V output. These do convert the 5V power input to 3.3V output required by the GPU as you are not directly providing that voltage and the GPU does need it to function properly. Also check for solder leakage that may be shorting things on the board, especially around the power connectors. We’ve had some cases of bad soldering where the ground pins of the Molex power connector were shorting out with the 12V pins of the empty space for PCI-E Power available on the board for the extender as these are pretty close to each other. Power shorts like this one usually do trigger the built-in protection of the Power Supply and it does not want to turn on at all or immediately shuts down when you try to power on the system. The smaller board that connects to a PCI-E slot on the motherboard rarely has issues and if it does it is a result of bad soldering of the USB connector on it. So far we’ve only seen really sloppy soldering job on some riser boards with green color PCBs where they were literally saving on solder and some of the pins had bad connection. That is easily fixable by resoldering the pins of the connector that are actually being used (not all of them are actually used). Other than that there is not much else that can go wrong here. You can use a multimeter to check the connection points on both boards through the USB cable with a multimeter just to be sure if you are experiencing some issues. We’ve seen a lot of different USB 3.0 cables being used with the PCI-E to USB 3.0 riser boards, but never had an issue with any of the cables, so he chances that something is wrong with the data cable are pretty slim. These cables are used for data transfer only, no power goes through them from the motherboard to the video card and that is why there is a power connector on the board of the extender. Although the name mentions USB 3.0 and we actually use USB 3.0 cables, there is no USB connectivity or support anywhere with these devices. They only use USB 3.0 cables as good quality shielded wires for extending a couple of data lines from the motherboard to the video card. You are not able to plug in a video card to a regular USB 3.0 slot with these extenders, it will not work, so do not try doing it. There are a couple of different power connectors available on different PCI-E to USB 3.0 extenders and in order to improve compatibility the package usually contains some sort of a power adapter that usually converts whatever connector is on the PCB to SATA Power. 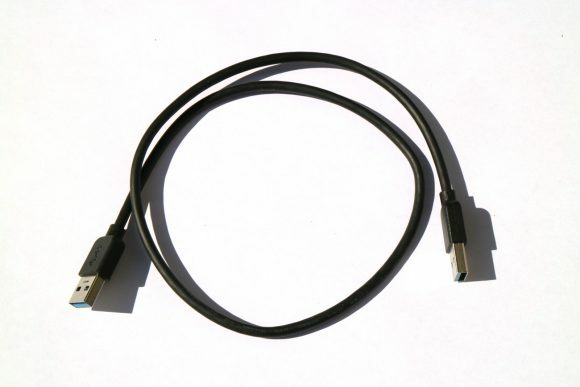 Most modern power supplies have a lot of SATA Power connectors and not as many Molex or other power connectors. 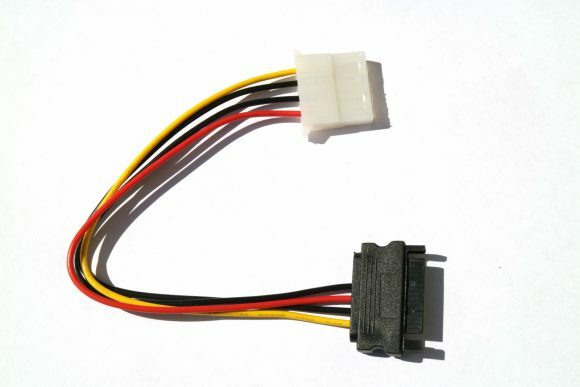 Still going for the extenders with the standard 4-pin Molex power connector is probably the best choice, even if you have to use the supplied Molex to SATA Power adapter. Just make sure that you do not connect more than two extenders to a single power line going to the power supply as even though this may not be a problem for the Molex or SATA power we’ve seen many cases where it becomes an issue for the modular power connector on the power supply side resulting in melted plastic of the connector, loose connection and issues with that. A while ago we’ve published some more useful information about power cables and power supplies that you might have missed, but checking it out may also save you some possible trouble in the future. When we are talking about GPU-based mining rigs for crypto currencies it is common for PCI-E extenders (or risers) to be used in order to be able to put more video cards on a single motherboard and use not only the available PCI Express x16 slots, but the smaller x1, x4 and x8 as well that were originally not designed to be used by video cards. You would normally not want to use these smaller slots with less PCI-E lanes for video cards that will be used for gaming for example, but they are more than enough for mining. 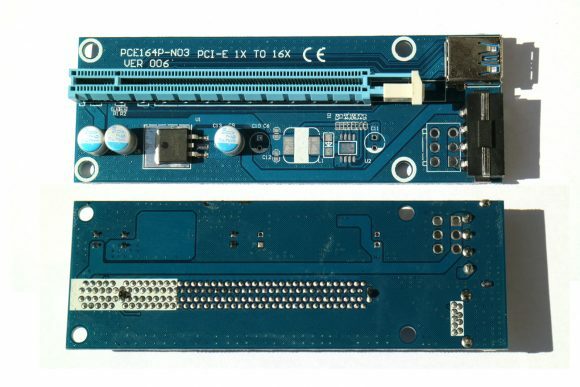 Up until recently you would use a x1 to x1 or x1 to x16 PCI-E raiser (Extended) with a short ribbon cable in order to utilize the smaller PCI Express slots for mining. But there is new and very interesting alternative available now – PCI Express x1-x16 USB 3.0 extenders. 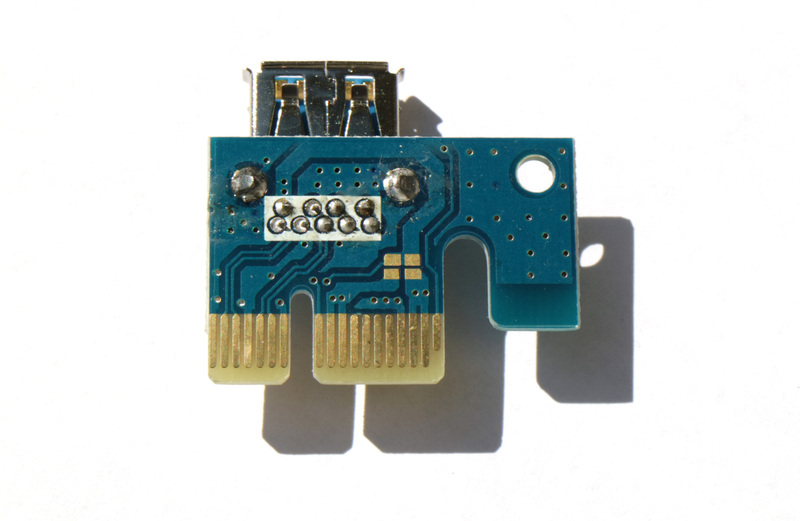 We have picked up a few of these new extenders to try them out as they look better designed and built as compared to the ones using ribbon cables, no to mention that the newer USB-based ones also offer some good advantages. Now, before continuing with out experience and impressions we should make something clear – these extenders only use USB 3.0 cable for data transfer they still connect to PCI-Express slot on the motherboard one one end and have a PCI-E slot that you put the video card in on the other end. They use USB 3.0 cable for data transfer as it is a reliable solution for high-speed data transfer and with good quality cable that is shielded you can easily get 50, 60 or even 100 cm length of the cable without problems. We have picked up extenders that do come with a long 1 meter cable and they work problem free and allow you to place the video cards further away from the motherboard and other cards, so that you can get better airflow and cooling. Aside from the additional length that can easily be up to 1 meter (up to 20-25 cm for ribbon cable extenders) these extenders are also powered, meaning that your motherboard will not need to provide any power over the PCI-E slot to the video card – all the power coming from the PCI-E slot of the extender is supplied by an external molex power connector, so you can safely use even video cards that do not have additional PCI-E power connector on their boards without worrying that you can overload your motherboard that is not designed to supply so much power over the PCI-E bus for multiple video cards. We have tested these extenders with cards with both no external PCI-E power as well as with models that do have additional power connector and they all worked just fine. Also tested with both Nvidia and AMD graphics processors and no issues with both types, though you should note that using Nvidia GPU such as the GeForce GTX 750 Ti with CUDAminer you will be getting a bit lower performance when using an extender (any kind of PCI-E extender). AMD graphics do not seem to have this problem, so the most likely reason is in the fact that you are using less PCI-E lanes for the video card and although AMD with OpenCL does not seem to have a problem, Nvidia with CUDA appears to provide a slightly lower performance. So if you are using a GeForce GTX 750 Ti with stock frequencies and are getting 255 KHS for Scrypt mining with the card directly plugged in the motherboard, if you put it on an x1 PCI-E extender you might get slightly lower performance in the 240-245 KHS range. The same goes for results with the card overclocked, from about 300 KHS on motherboard you can expect 285-290 KHS when you are using a x1 PCI-E extender. Unfortunately to avoid that you need to use full x16 PCI-E slots and/or extenders and that could limit significantly the number of cards you can install on a single motherboard. In short, we are really satisfied with the PCI Express x1-x16 USB 3.0 Extenders. They offer better build quality and reliability as compared to ribbon cable extenders. You also get more freedom for placement of the video cards thanks to the longer cables for better airflow and cooling performance. The slight drop in performance when using Nvidia-based graphics cards for mining with the extenders is to be expected, but might be resolved in future updates for CUDAminer for example.